Cineworld, one of the UK’s leading cinema chains has unveiled its first ever Unlimited Movie Tour. 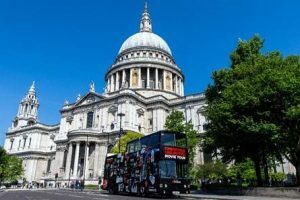 The brand new concept is completely free and features a bespoke double decker bus designed to bring London’s most iconic film locations to life and replicate the special Unlimited customer experience. The tour will culminate in a free film screening at Cineworld’s newly refurbished flagship cinema in the heart of Leicester Square. The Cineworld Unlimited Movie Tour starts its journey at Hyde Park and lasts one hour, forty-five minutes, hosted by a professional tour guide. It will take in London’s landmark movie sites including Blackfriars Bridge – Mission Impossible: Fallout, Buckingham Palace – Mary Poppins Returns and Trafalgar Square – Wonder Woman. The Unlimited bus is a branded double decker Routemaster, which has been transformed to resemble the interior of a Cineworld cinema, with customised features including their signature red cinema seats, large screens, and a refreshment counter with soft drinks, popcorn and pick & mix. In addition to the Unlimited Movie Tour experience, Cineworld recently announced a new three-year restaurant partnership deal with leading UK-based mid-market restaurant company Casual Dining Group that operates the Bella Italia, Café Rouge, Las Iguana, Belgo and La Tasca restaurant businesses. This new partnership will afford Cineworld Unlimited cardholders a 25% discount on food and drink across each of the five aforementioned brands across the UK. Cineworld Unlimited offers great value for money, with unlimited cinema for just £17.90 per month (or £20.40 for London West End cinemas). The Unlimited card also unlocks a world of benefits, including 10% off cinema snacks and drinks (25% off in your second year), 25% off at restaurant partners, free months when you recommend friends, and access to advance screenings nationwide. For more information about the Cineworld Movie Tour Experience, visit www.cineworldmovietour.com/ or to learn more about the Cineworld Unlimited Card visit www.cineworld.co.uk/unlimited.